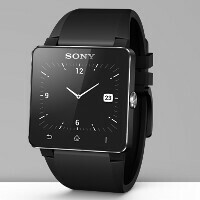 Back in June, when the Sony SmartWatch 2 was introduced, we told you to expect the device to launch in September. For some reason, Sony told Clove to expect the watch to be released on July 15th. When Monday came and went without the watch to sell, Clove went back to Sony and the Japanese OEM gave the U.K. retailer a new launch date of September 9th. If you placed an order for the watch with Clove, they will hold the funds and ship out your watch once it is launched. The handset is IP57 certified for water and dust proofing, which means it can survive under 1 meter of H2O for 30 minutes. Besides sharing that protection with the Sony Xperia Z and Sony Xperia Z Ultra, the Sony SmartWatch 2 also shares buttons on its aluminum frame with those two phones. The watch has 200 apps and developers have access to an open API to write more. The device is compatible with all Android models running Android 4.0 or higher, using NFC connectivity. The watch allows you to answer or ignore calls. It also offers a call log and a missed call notification. There is both a calendar and a weather app and more apps can be found at the Google Play Store. With Apple running into problems producing the iWatch, can another manufacturer step into the void and take over leadership of what is supposed to be the next major area of innovation? 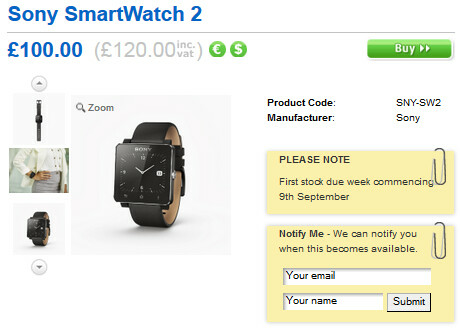 The Sony SmartWatch 2 will be priced at £120.00 ($181 USD) including VAT at Clove. iWatch is having production issues I don't even see a release date. This one has me interested, mainly because it looks like a watch more than just a condensed phone. Any word on battery life? I wonder what will have more apps between this and Pebble. I do like that white pebble though more than the look of this Sony one.